When you choose to try colon hydrotherapy it is important to prepare for the procedure – read our preparation guide and feel free to contact us with questions. Please arrive on time to your appointment. We ask that you allow your body the time it needs to complete your session, as well as to be respectful of the next client’s time. Please download and fill out the new patient intake form before your first appointment. The Libbe is an Open System, Gravity Centered Colonic. An I-ACT certified Colon Hydrotherapist will assist you in the comfort of a private room and will be with you for the entire treatment, though you have the option of as much privacy as you wish. The dignity and comfort of the client is always respected. During treatment, a soothing flow of purified, temperature-regulated water gently flows into your colon, eliminating the accumulation of toxins and waste, promoting a clean, healthy body. 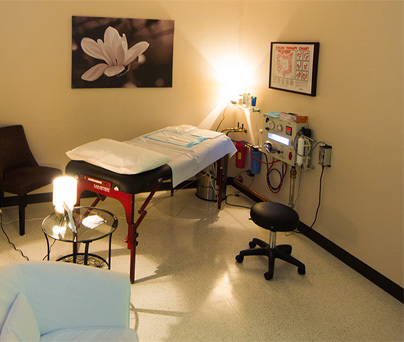 Please refer to the FAQ’s page under “How is session administered?” to read more detailed information on our Closed Colonic treatment and learn the differences between our two safe and effective colonic method options. During our Colon Hydrotherapy treatment, a soothing flow of purified, temperature-regulated water gently flows into colon, eliminating the accumulation of toxins and waste, promoting a clean body from the inside out. This treatment is performed with the Toxygen Model BSC-UV, which cleanses the entire colon without the use of any drugs or chemicals. It is a closed system, so there is no smell or sound. A built-in water treatment system purifies the water. 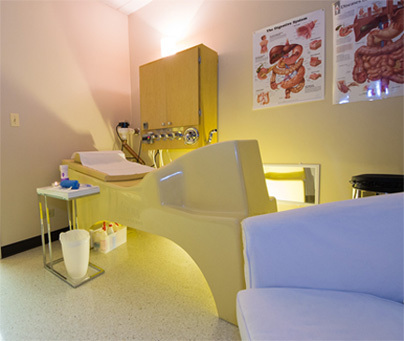 This is a therapist-assisted colon hydrotherapy procedure that maintains the dignity and comfort of the client. Dotolo Research Corp. and Libbe have been defining the standard in colon hydrotherapy equipment since 1984. With equipment now being used in over 35 countries, the companies are recognized as the worldwide leaders in the manufacturing of colon hydrotherapy equipment. We only use Dotolo and Libbe devices for our treatments because we demand the very best for our clients. Dotolo and Libbe have a company-wide commitment to quality and continuous improvements that is confirmed by its certification by independent auditors to ISO 9001-2000, ISO 13485 and CE (European Union) standards. Please be aware, we have a strict 24 hour cancel or change appointment time policy. If 24 hour notice is not given, your account will automatically be charged full price for a missed appointment. Please show up on time. Late arrival may be considered a missed appointment that you will also be financially responsible for. We do understand the rare occasion that you may need to make an emergency cancellation. Thank you for understanding that your therapist is there especially for you and a time slot is saved for you. When given proper notice we can open your time slot to allow a client from our wait list to come. Please be assured that this policy is in place for your benefit as well as ours.